Mallorca is the largest of the Balearic Islands and has a rich diversity of landscape: rugged mountains, windmill-dotted plains, pine-covered hills, golden beaches and sandy coves. Mallorca's wonderful climate, beautiful landscapes as well as its cosmopolitan ambience make it a privileged holiday resort, with a cultural offer comparable to the one of many European capitals. The Auditiorio de Palma, for instance, ranks among Europe's top concert halls. At Mallorca, you will find relaxation, inspiration, culture and entertainment. Visit the historic capital, Palma, or the monastery at Valldemosa where Chopin stayed. Explore the village markets and wonderful fishing villages, have an adventure in the caves at Porto Cristo, admire the spectacular views from Cap de Formentor. There is always something new to see or do in Mallorca. The hotel complex Ona Garden Lago is a resort situated in the North of Majorca in the Bay of Alcudia. This residential area offers holiday makers the possibility to benefit from an exceptional stay and the best side of thi more. Club Cala Pi is situated on a rocky promontory in an unspoiled area of the south coast of Mallorca. The resort has two swimming pools, bar, restaurant, shop, fitness room, and children's playground. There are steps le more. The Catalonia Majorica hotel is located in a privileged area on the maritime promenade of Palma Bay and just in front of Club del Mar. It is near the Porto Pi shopping centre and the Fundacio Joan Miro. The hotel, refurbis more. 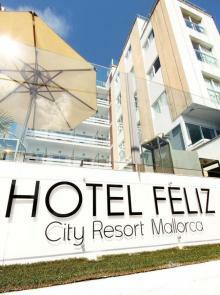 Hotel Feliz is a small boutique hotel featuring a roof terrace with panoramic views. The hotel has a restaurant and a rooftop plunge pool with views of Palma Bay as well as another plunge pool on the ground floor. The recently refurbished Hotel Saratoga is situated in a central, but quiet location, in Palma (Mallorca), near one of the most popular and prestigious commercial avenues of the city - Avenue Jaime III - close to the Paseo Maritim more. Isla Hotel & Spa is an urban hotel in Palma de Mallorca that combines modern facilities, with charm and an excellent level of customer service. Located next to the Paseo Maritimo, next to the Cathedral in the lively area o more. All the apartments of our apartment hotel in Palmanova, Mallorca , hav more.